Myth: Relapse into heavy drug or alcohol use after a period of abstinence not means that you have failed.? Relapsing at least once is common in any type of addiction, and should not be considered a negative outcome. After relapse, it is vital for your long-term sobriety to re-enter a Moksh rehabilitation treatment program immediately and jump back on the road to recovery. Relapse prevention planning is a critical element in ensuring that a person who is recovering from drug or alcohol addiction does not return to using drugs or alcohol. Relapse occurs when a person who has abstained from using drugs or alcohol for any period of time begins to use again. This use may be a brief, one-time lapse in abstinence, or it may be a binge that involves large amounts of drug or alcohol use. 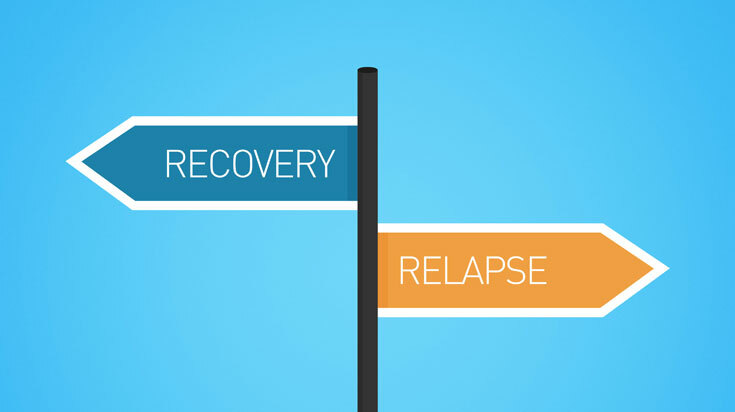 In both situations, relapse does not mean you cannot get back on the road to recovery.Traditional alcohol and drug addiction treatment approaches often include a drug and alcohol relapse prevention plan in their recovery programs, contact moksha to guide you. Those seeking help for drug or alcohol addiction relapse prevention can call 8390140099 to contact moksha. Myth: Relapse into heavy drug or alcohol use after a period of abstinence means that you have failed. Relapsing at least once is common in any type of addiction, and should not be considered a negative outcome. After relapse, it is vital to your long-term sobriety to re-enter a treatment program immediately and jump back on the road to recovery. There are several situations that may play a role in contributing to relapse. Part of a successful drug and alcohol relapse prevention plan is to know and recognize the signs of high-risk situations that may lead to relapse. Emotional or Mental Health Issues: Negative emotional states such as depression, anger, anxiety, or even boredom often present a high-risk situation associated with relapse. Conflict: Situations that include other people, particularly conflicts with other people, can result in negative emotions, and eventually lead to relapse. Social Pressure: Social pressure includes both verbal and nonverbal pressure from friends or people in your social circles. This pressure may seem harmless, such as being around people who are drinking or using drugs, or it may be direct, such as a friend teasing you about not using. Celebrations or Positive Emotional Conditions: A wedding, sporting event, graduation, or other positive events to which alcohol may be linked can play a large role in contributing to relapse. A vital component of relapse prevention is to learn how to detect the warning signs that often lead to a lapse in abstinence. Through identification, you can take positive steps to remain on your path to recovery. This learning includes compiling a plan that addresses your addiction. The better you are at spotting the signs of possible relapse, the earlier you can take action to ensure long-term recovery. It is not uncommon for a person to relapse at least once during recovery. This usually happens when thoughts of drinking or using drugs resurface in early stages of recovery. These thoughts can manifest in dreams and may not signal an alarm initially. However, when the dreams bleed into your waking moments and the urge to use again becomes compelling, there are things that you can do to avoid a relapse into drinking or drug use. You can call 8390140099, 8am to 8 pm, seven days a week at moksha rehab facility that can help you create a relapse prevention plan. Manage feelings and problems as they occur. By handling day-to-day issues as they arise, you limit the stress that accompanies them prevent negative emotions from building up until they become overwhelming. Do not avoid dealing with negative emotions, however, because this can also result in a buildup of stress and negative emotions. Maintain a balance in your life. It’s vital to alcohol and drug relapse prevention to find ways to balance work and relaxation. This reduces your stress levels so that you’re better able to cope with whatever life throws at you each day. Remember to reward yourself with things that give you pleasure, such as a hobby. Fill your free time with a range of activities until you find the activities that you enjoy most. Surround yourself with people who support and trust you. Friends, family, a support group, or a counselor are excellent safety nets to help prevent relapse. With this support network, you can talk through negative feelings and you have the security of knowing that others are also looking for warning signs of relapse. Let each person in your support network know your goals and plans so that he or she can assist you in achieving them. The signs of emotional relapse are also the symptoms of post-acute withdrawal. If you understand post-acute withdrawal it’s easier to avoid relapse, because the early stage of relapse is easiest to pull back from. In the later stages the pull of relapse gets stronger and the sequence of events moves faster. Relapse prevention at this stage means recognizing that you’re in emotional relapse and changing your behavior. Recognize that you’re isolating and remind yourself to ask for help. Recognize that you’re anxious and practice relaxation techniques. Recognize that your sleep and eating habits are slipping and practice self-care. If you don’t change your behavior at this stage and you live too long in the stage of emotional relapse you’ll become exhausted, and when you’re exhausted you will want to escape, which will move you into mental relapse. Practice self-care. The most important thing you can do to prevent relapse at this stage is take better care of yourself. Think about why you use. You use drugs or alcohol to escape, relax, or reward yourself. Therefore you relapse when you don’t take care of yourself and create situations that are mentally and emotionally draining that make you want to escape. For example, if you don’t take care of yourself and eat poorly or have poor sleep habits, you’ll feel exhausted and want to escape. If you don’t let go of your resentments and fears through some form of relaxation, they will build to the point where you’ll feel uncomfortable in your own skin. If you don’t ask for help, you’ll feel isolated. If any of those situations continues for too long, you will begin to think about using. But if you practice self-care, you can avoid those feelings from growing and avoid relapse. In mental relapse there’s a war going on in your mind. Part of you wants to use, but part of you doesn’t. In the early phase of mental relapse you’re just idly thinking about using. But in the later phase you’re definitely thinking about using. Play the tape through. When you think about using, the fantasy is that you’ll be able to control your use this time. You’ll just have one drink. But play the tape through. One drink usually leads to more drinks. You’ll wake up the next day feeling disappointed in yourself. You may not be able to stop the next day, and you’ll get caught in the same vicious cycle. When you play that tape through to its logical conclusion, using doesn’t seem so appealing. A common mental urge is that you can get away with using, because no one will know if you relapse. Perhaps your spouse is away for the weekend, or you’re away on a trip. That’s when your addiction will try to convince you that you don’t have a big problem, and that you’re really doing your recovery to please your spouse or your work. Play the tape through. Remind yourself of the negative consequences you’ve already suffered, and the potential consequences that lie around the corner if you relapse again. If you could control your use, you would have done it by now. Tell someone that you’re having urges to use. Call a friend, a support, or someone in recovery. Share with them what you’re going through. The magic of sharing is that the minute you start to talk about what you’re thinking and feeling, your urges begin to disappear. They don’t seem quite as big and you don’t feel as alone. Wait for 30 minutes. Most urges usually last for less than 15 to 30 minutes. When you’re in an urge, it feels like an eternity. But if you can keep yourself busy and do the things you’re supposed to do, it’ll quickly be gone. Do your recovery one day at a time. Don’t think about whether you can stay abstinent forever. That’s a paralyzing thought. It’s overwhelming even for people who’ve been in recovery for a long time. One day at a time, means you should match your goals to your emotional strength. When you feel strong and you’re motivated to not use, then tell yourself that you won’t use for the next week or the next month. But when you’re struggling and having lots of urges, and those times will happen often, tell yourself that you won’t use for today or for the next 30 minutes. Do your recovery in bite-sized chunks and don’t sabotage yourself by thinking too far ahead. Make relaxation part of your recovery. Relaxation is an important part of relapse prevention, because when you’re tense you tend to do what’s familiar and wrong, instead of what’s new and right. When you’re tense you tend to repeat the same mistakes you made before. When you’re relaxed you are more open to change. Once you start thinking about relapse, if you don’t use some of the techniques mentioned above, it doesn’t take long to go from there to physical relapse. Driving to the liquor store. Driving to your dealer. It’s hard to stop the process of relapse at that point. That’s not where you should focus your efforts in recovery. That’s achieving abstinence through brute force. But it is not recovery. If you recognize the early warning signs of relapse, and understand the symptoms of post-acute withdrawal, you’ll be able to catch yourself before it’s too late…….